Blaüfrankish originated in Austria, but spread to Germany (Lemberger), Hungary (Kékfrankos), and Croatia (Frankovka). As Zweigelt, Frankovka is also typical continental red grape variety but more subtle, elegant and good for ageing in the wood and with good potential for bottle ageing. Food pairing: Perfect wine for all kinds of meat, especially red and darker meat, venison, sauces, stews, etc. 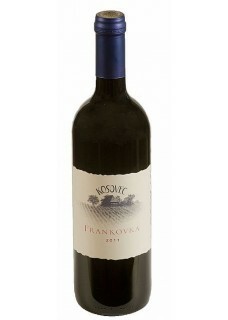 A revival of of Škrlet was on the mind of young Ivan Kosovec from the town of Popovača in Continental Croatia and an indigenous varietal of the region of Moslavina. It was a vine that only grows in this hilly area and nowhere else in the world, the grape is an unknown varietal outside of these regional walls. The grape has tiny red “freckles” so Skrlet is derived from the German word “scharlach, meaning a speckled or dotted surface that are reminiscent those of a Scarlet fever rash. Driven by his passion on hands off winemaking Kosovec made this ordinary, almost forgotten, table grape into something extraordinary not only reviving the planting of more vines but also the elevation of taste and structure of days past.